March 1985, Moscow. Mikhail Gorbachev loses the race to succeed Konstantin Chernenko as head of the USSR. Early September, 1985. A clash between Soviet and US Navy aircraft leaves several pilots dead. The world totters on the brink of war. Late September, 1985. World War III erupts. 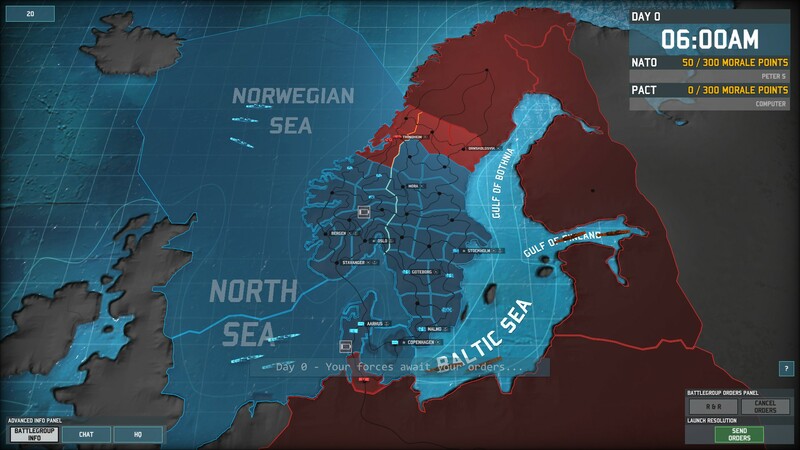 Norway and Denmark, comprising NATO’s northern flank, are on the front line. 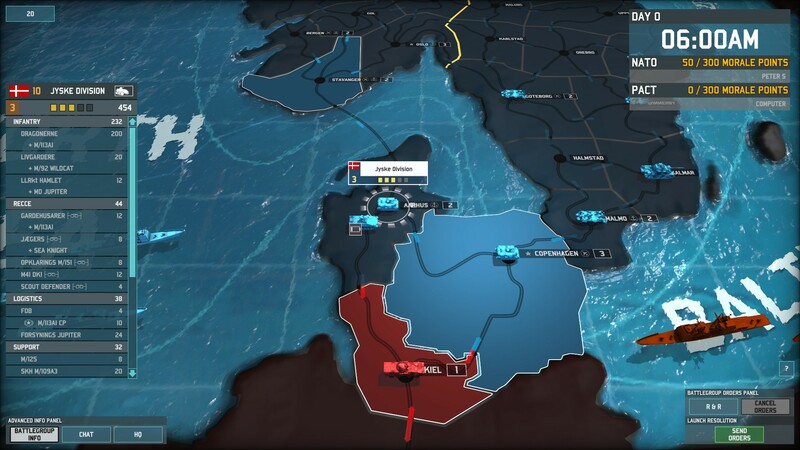 The Norwegian army manages to halt the Soviet advance – only for Soviet troops to roll into neutral Sweden, threatening Norway’s eastern flank. 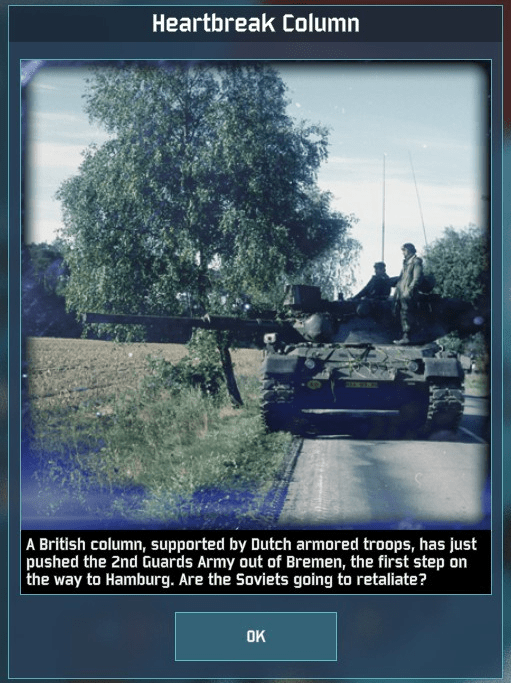 To the south, the Soviet advance into West Germany leaves their forces on the border with Denmark. NATO’s troops are badly battered. Enemy reinforcements abound. Scandinavia hangs in the balance. Can my leadership save the day? Welcome to my Let’s Play of Wargame: AirLand Battle. 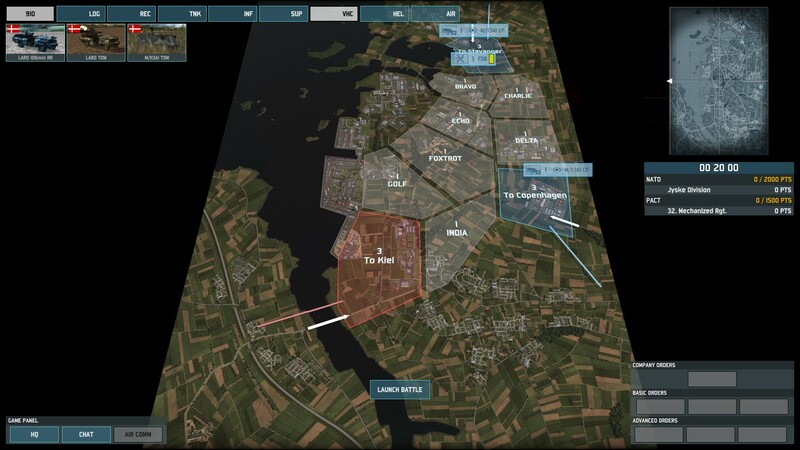 Wargame: AirLand Battle is a newly released strategy game for PC, a blend between the real-time strategy and traditional wargame genres (for more background, check out the other posts I’ve written about the Wargame series, linked at the top of this page). In addition to multiplayer and skirmish modes, AB offers four single-player campaigns of varying length and difficulty; I have finished the shortest and simplest campaign, which is really a tutorial in disguise. For this LP, I will be jumping all the way to the longest and most challenging, “War in the North”. 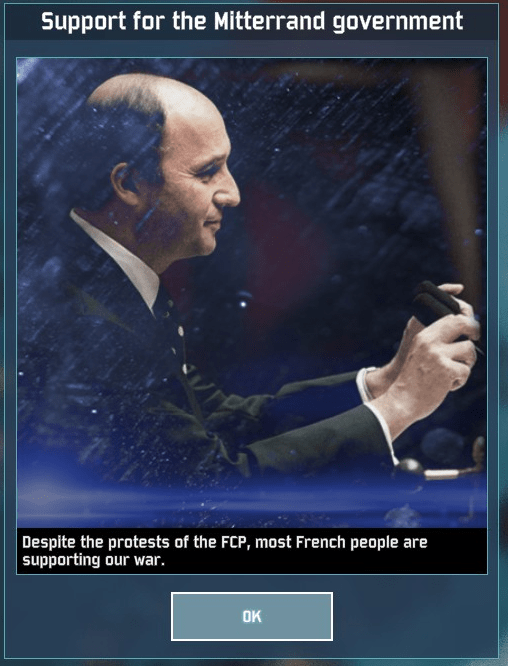 The game bills this campaign as “Very Hard”, but I’m confident I’ll be up to it. (And, hey, everything worked out the last time I LPed a difficult game.) I will play the campaign either until I win/lose, or until it stops being fun. Here goes! 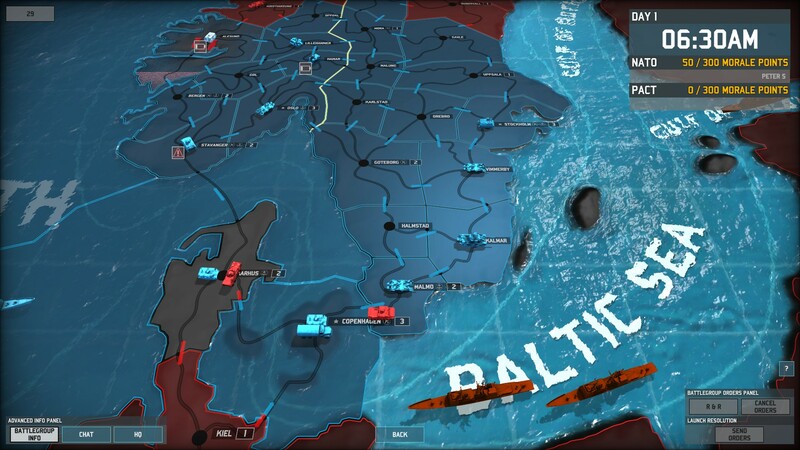 AB’s strategic game is played out on the above map, where players take turns moving around battlegroups, each with a specified composition. When two hostile battlegroups move into the same region, a tactical battle begins. 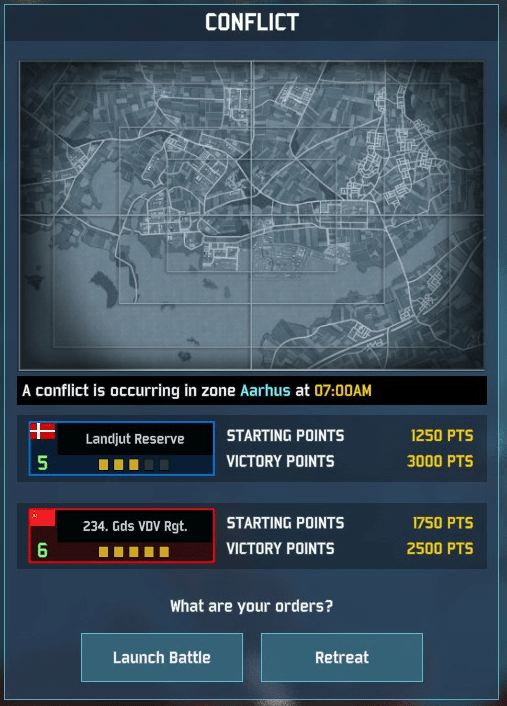 In between battles, players can use accumulated “political points” (visible at the top left of the screen) to request reinforcement battlegroups or call in special missions such as air strikes, commando raids, etc. To the top right is the morale meter. I have to break the Warsaw Pact’s morale in 20 turns to win this campaign. 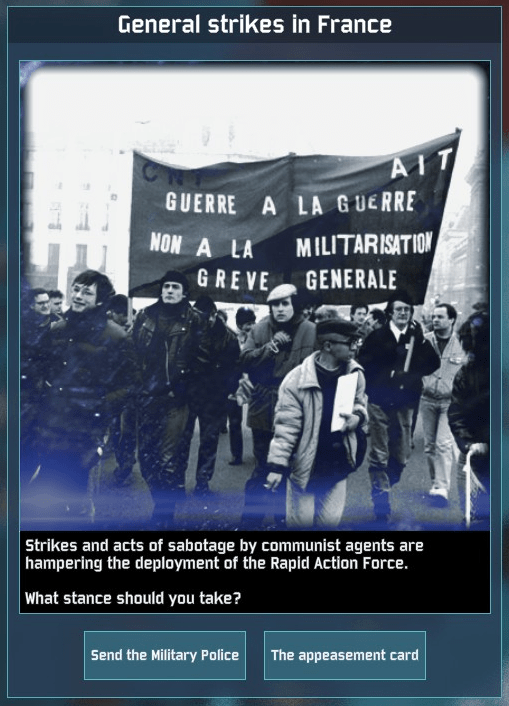 The very first thing I see is this random event, which gives me a choice between naval reinforcements (which will delay the arrival of Soviet troops from Leningrad) and ground reinforcements (a single reservist brigade at the north of the map). I choose the naval reinforcements, for reasons we’ll see later. The three key aspects of the starting situation are the map, my forces, and the enemy’s forces. Let’s address these one by one. The Swedes are heavily armed, but – caught halfway through mobilisation – are also suffering from low initiative. Below, I’ve shown a typical Swedish battle group. 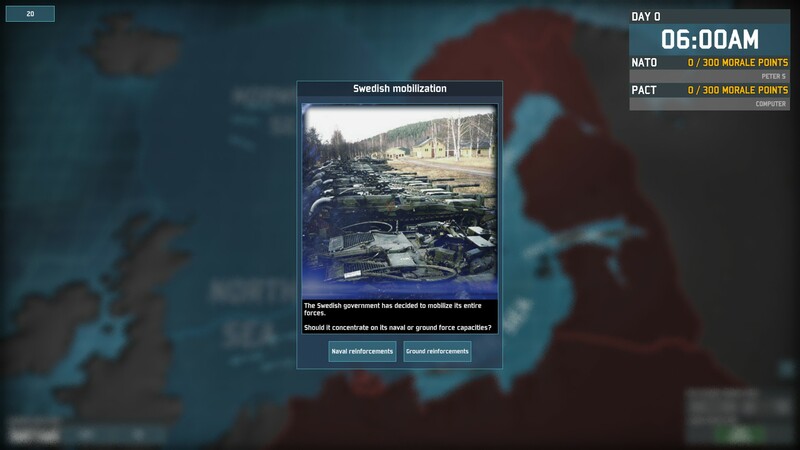 The exception is the Swedish brigade defending Stockholm, which (a) has maximum initiative, and (b) has more infantry and fewer tanks than its compatriots. In other words, if it has the income, the Pact could flood me with troops early on. Meanwhile, significant NATO reinforcements only arrive later in the campaign. On top of that, the Pact’s reinforcements will mostly comprise paratroopers and heavy (armoured/mechanised) battlegroups, whereas mine tend to be more lightly armed. Lastly, each side’s reinforcements will spawn in different places. 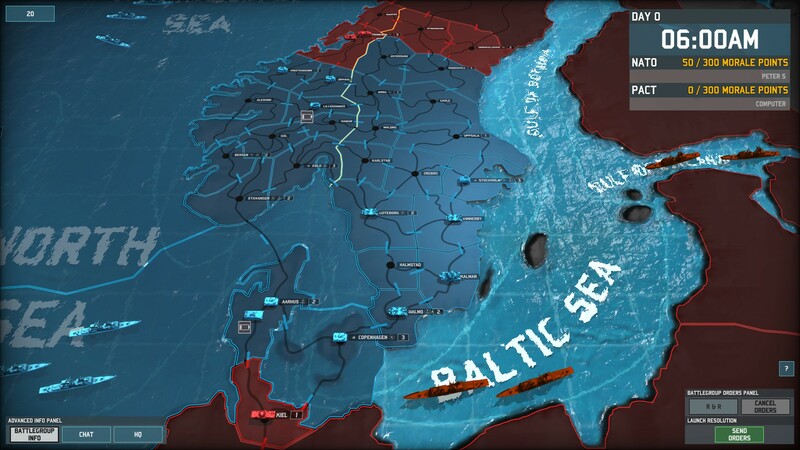 The Pact forces will largely move in from the map edges: the north via occupied Norway/Sweden, the south via Kiel, and through the Baltic. 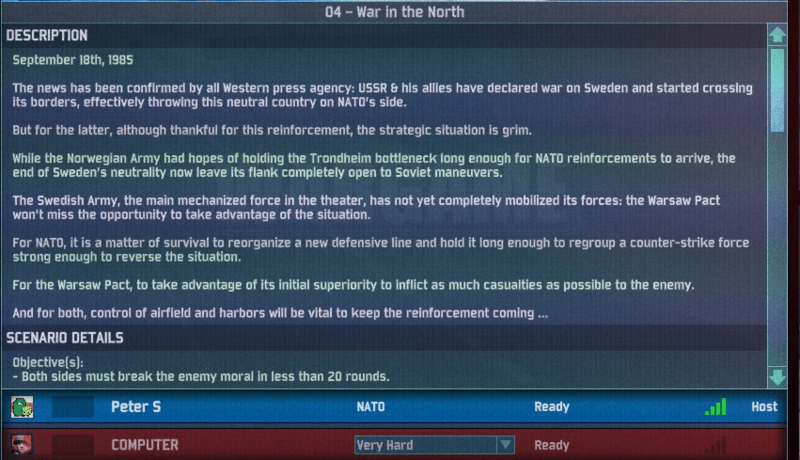 (This is why I chose Swedish naval mobilisation earlier – I want to delay that last avenue of advance.) NATO’s reinforcements will rely on airports and Atlantic ports. Each side’s marines and paratroopers will be the wild card. With the above considerations in mind, my strategy becomes clear: abandon the northern part of the map and focus on holding the south. Specifically, I will hold a triangle that runs from the west coast of Norway, down southeast through Denmark, and up to Stockholm. 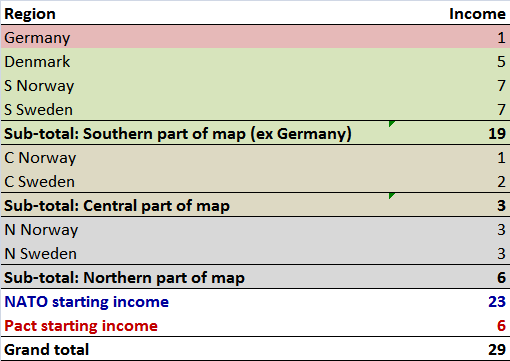 My priorities will be (a) to hold the key air/port provinces, and (b) hold the high-income provinces (especially the capital cities!). Ouch. 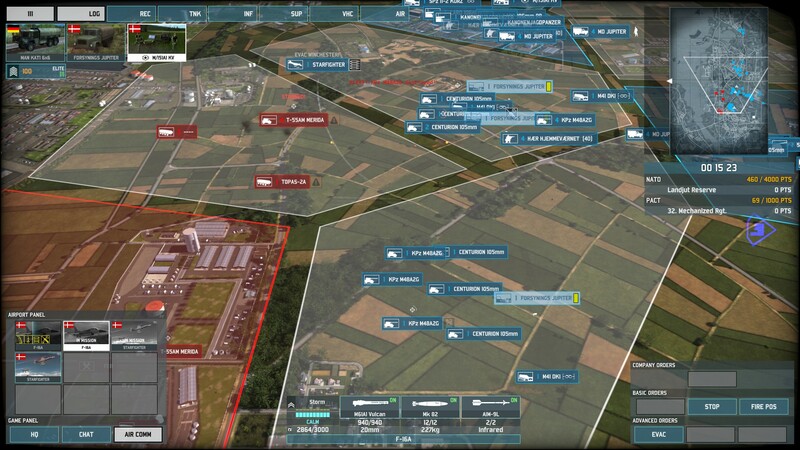 High morale (the green “6” next to the initiative bar), high initiative, modern tanks and helicopters and planes. If I had any doubt about what to do next, this intelligence has dispelled them. 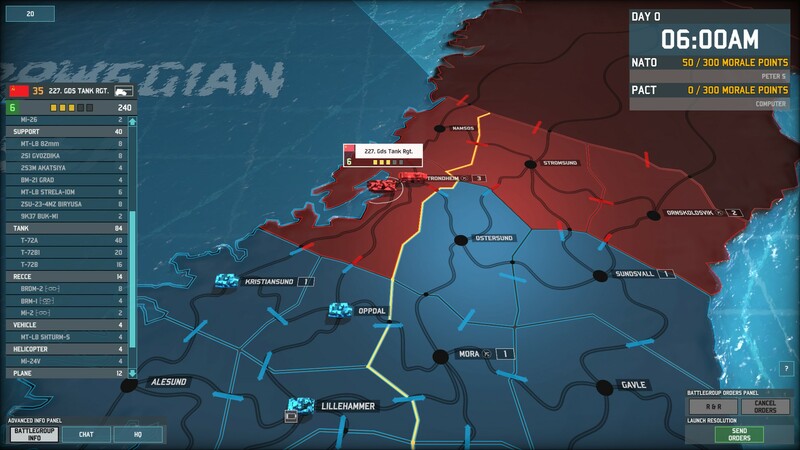 Next, I order my forces to converge on southern Norway: the badly battered West Germans will move up to Stavanger from Aarhus, the Swedish 9 Pansarbrigaden will move to Oslo from Goteborg, and the Norwegian army will move south. 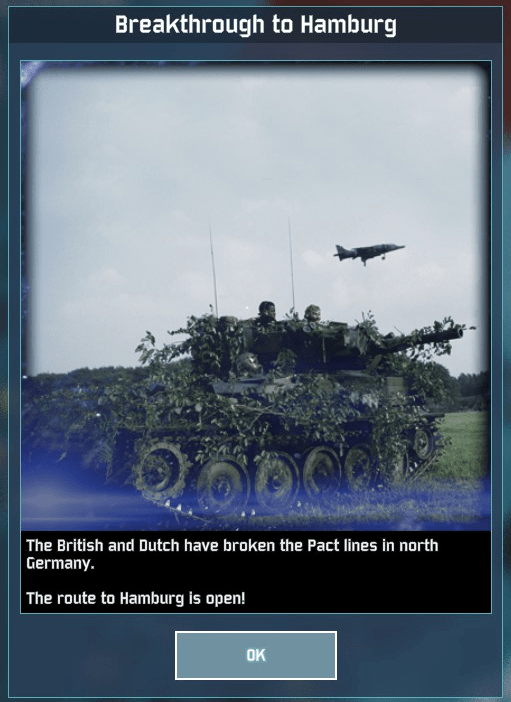 This will kill two birds with one stone: the West Germans and Norwegians will hopefully get some breathing space away from the enemy, and they’ll also be able to protect the vital southern Norwegian ports against paratroopers. My remaining units will take a turn to rest and refit in order to regain their initiative. This is the battlefield. 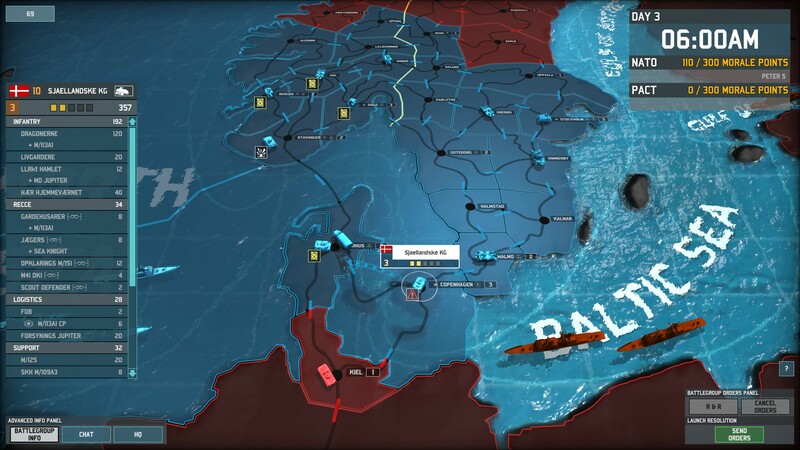 NATO can deploy in the blue zones, the Pact in the red zone. Zones with arrows are crucial – they allow reinforcements to be called in, they allow (in the campaign) an army to retreat if it loses the battle, and in the campaign, they also provide significantly higher income. 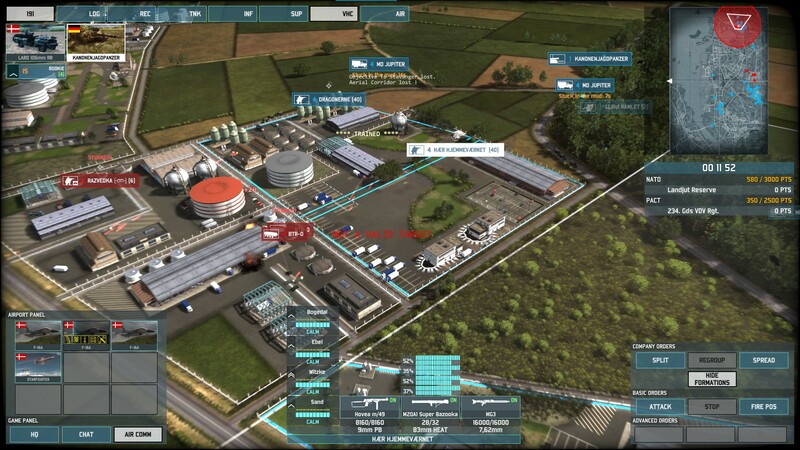 I deploy a mixed force of tanks and support units, and send some infantry to secure that big industrial complex in Echo. Under other circumstances, this would probably be fairly easy; the 32nd’s equipment is no better than the Jyske Division’s, and I have the advantages of (a) being on the defence, and (b) being a better player than the computer! But the enemy has an ace up its sleeve: helicopters. There’s nothing scary about them… if you have a good selection of anti-aircraft weaponry. But the Danes’ AA is limited to very short-ranged Hamlet missiles, carried by infantry; and big, powerful, long-ranged, and hard to move Hawk missiles. I end up having to call in my precious fighter planes to deal with the helicopters – and losing a couple. Grr. And that low initiative (and hence, small starting army) turns out to be my downfall. 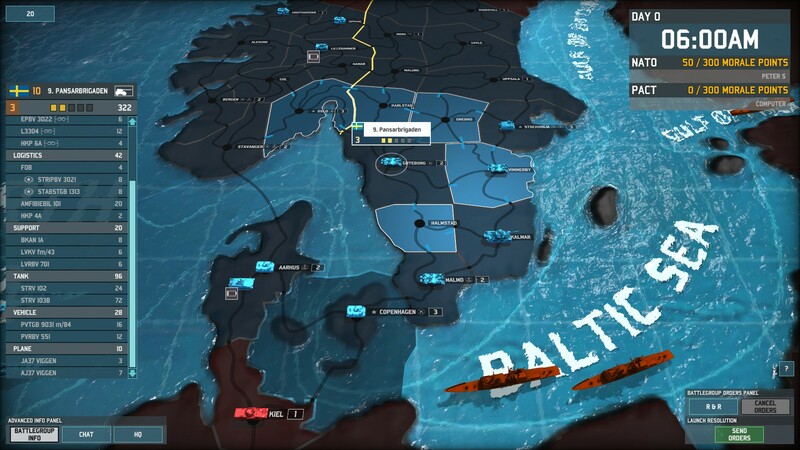 I abandon the southern reinforcement zone (“To Copenhagen”) and dig in at the northern one. While the West Germans’ superior equipment swats most of the Polish helicopters and aircraft out of the sky, I don’t have the points to prevent a mass of Polish tanks overrunning my position. Ouch. The main Soviet army is slowly advancing from the north, and the shattered remnants of the West German battlegroup have pulled back across the straits to Stavenger. Otherwise, pretty much everything is still in place. 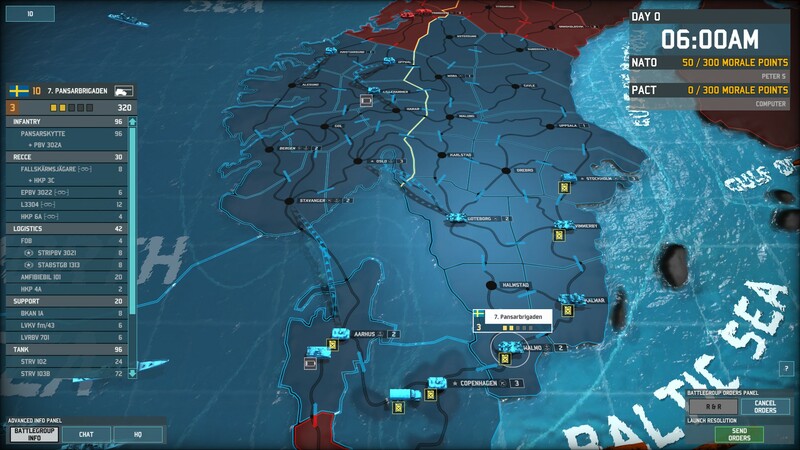 So is my strategy: the Norwegians keep withdrawing south, and as tempting as it is to do something with the Swedish army, I order it to stay in place and continue refitting – I want those Swedish brigades in top shape when the Soviets finally show up. 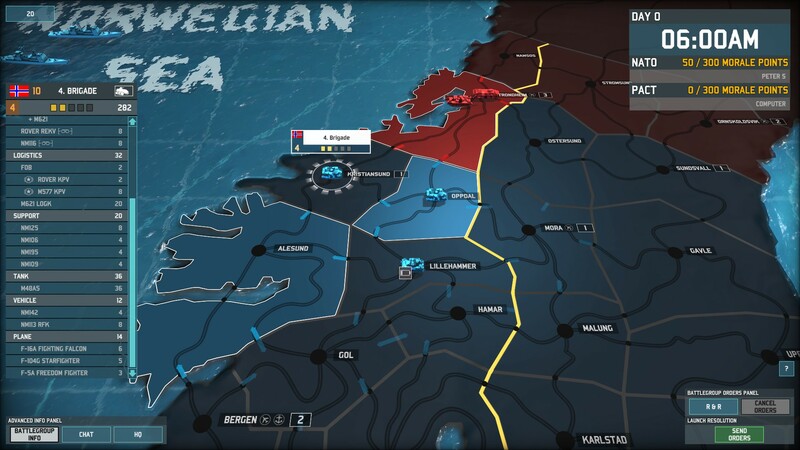 The Swedish 9th Pansarbrigaden in Oslo moves southwest to Stavanger, with an eye to protecting the vulnerable Germans (in their routed state, they’ll be automatically destroyed if they’re attacked!) and covering the approach to Aarhus. Otherwise, I largely stay put. The 32nd Mechanised and the Jyske Division fight a rematch in Aarhus, but with the Polish airpower almost entirely destroyed, this battle goes much more smoothly. 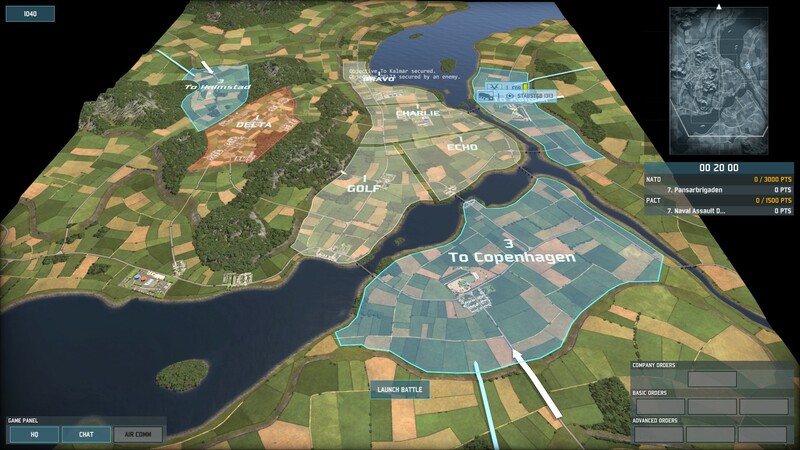 While the Danish infantry defending the industrial complex in the middle of the map take heavy casualties, they fight the 32nd to a draw. Perhaps just as importantly, my forces also destroy most of the 32nd’s tanks and heavy equipment. I get to deploy in all three reinforcement zones, which means (a) I’ll have the Poles surrounded, (b) they can neither retreat nor call in new units unless they can seize one of my reinforcement zones, and (c) I’ll have enough income to deploy plenty of reinforcements. Encircled by Swedish tanks and mechanised infantry, with artillery raining down on their heads, the Polish marines put up a brave but futile fight. The result is NATO’s first great success of the campaign: the Polish survivors surrender, the 7th Naval Assault Division is wiped out, and I’m 30 morale points closer to victory! Well, so far, things aren’t too bad. In the southwest, the Norwegians have reached the defensive line that I intend to hold. Now it’s their turn to rest and refit. 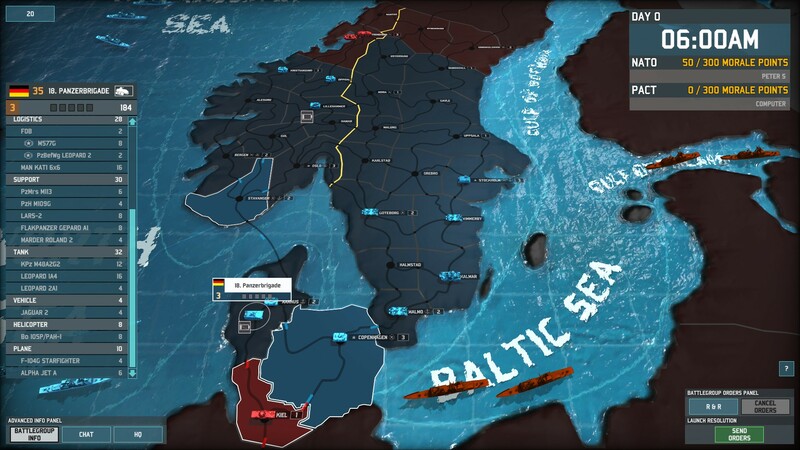 To the east, I begin pushing most of the Swedish army further north (and away from the coastline – I’ll take my chances with Pact marines). That includes the 9th Pansarbrigaden currently in Norway – I move it up to Gol. In the south, I roll the dice. 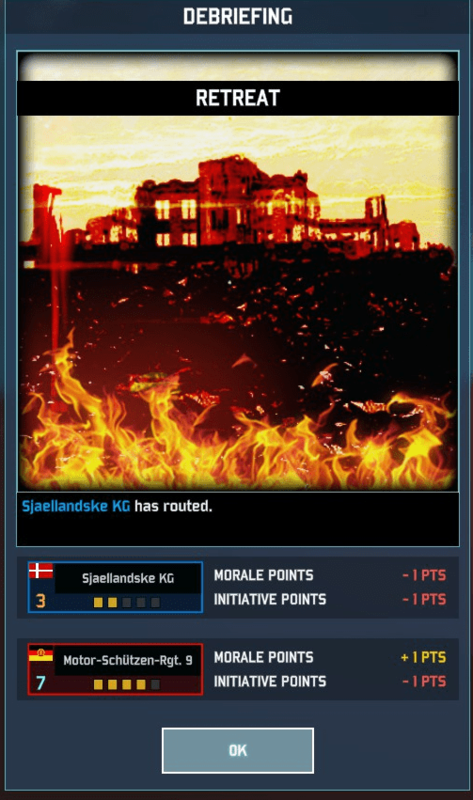 Now that my troops in Copenhagen have regained some of their initiative, I decide to attack. I order the Landjut Reserve into Aarhus to reinforce the Jyske Division – and, hopefully, deliver the coup de grace to the Polish 32nd Mechanized. Meanwhile, the Sjaelland KG will move out of Copenhagen, southwest into Kiel. Also, I now have enough points saved up to call for reinforcements! In addition to the US Marine 4th MAB from earlier, new reinforcements have become available this turn. The British 3rd Commando Brigade lacks tanks and heavy weapons, but its Royal Marine infantry are some of the best available to NATO. The paratroopers of the US 1st Brigade, 82nd Airborne Division are also lightly armed, but can drop in anywhere on the strategic map. The British 1st Infantry Brigade is a traditional, slow-moving, hard-hitting mechanised infantry force supported by modern Challenger and Chieftain tanks. I consider which to deploy… and in the end, I don’t. First, I don’t need them yet. 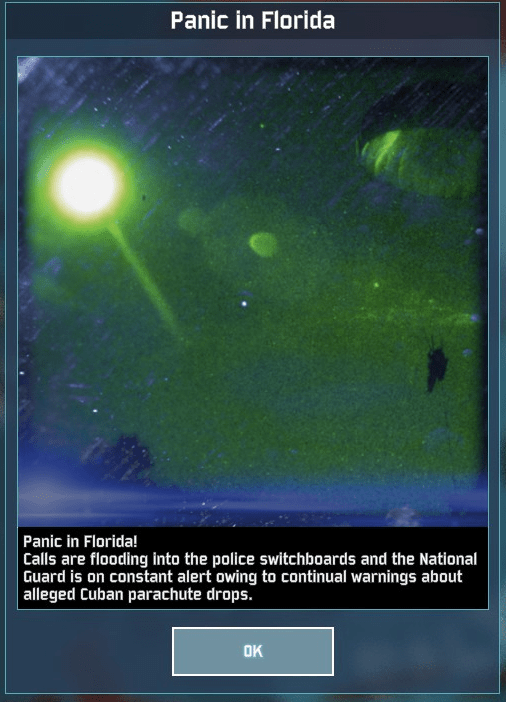 And second, especially in the case of the marines and paratroopers, I want to save them for when I really will need them. 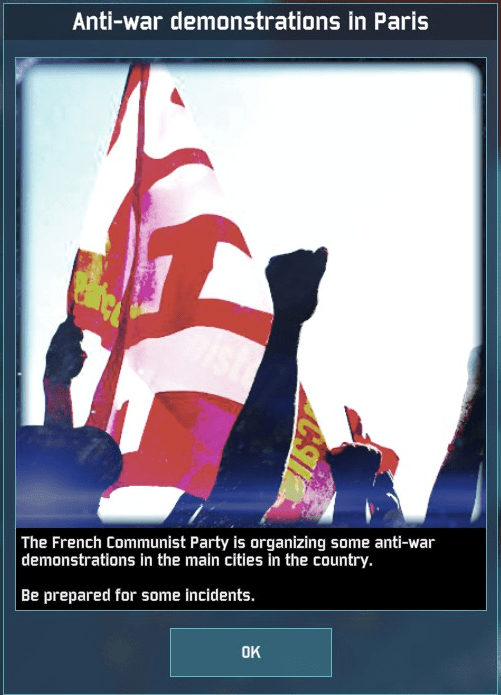 Sending in the military police, the game warns, will lead to a “moderate chance of being outflanked”, while a conciliatory approach will lead to a delay in deploying French troops. I opt for the olive branch. First, a delay in deploying French troops is no big deal; I already have more available reinforcements than I can afford to call in. And second, I’d rather deal with the devil I know (that delay) than the devil I don’t (just what are the consequences of “being outflanked”?). The reservists lose many of their tanks, but they carry the day: I first seize the 32nd Mechanized’s escape route to Kiel, then win a total victory. Another Pact brigade has been forced to surrender, and my score has increased by another 30 morale points! 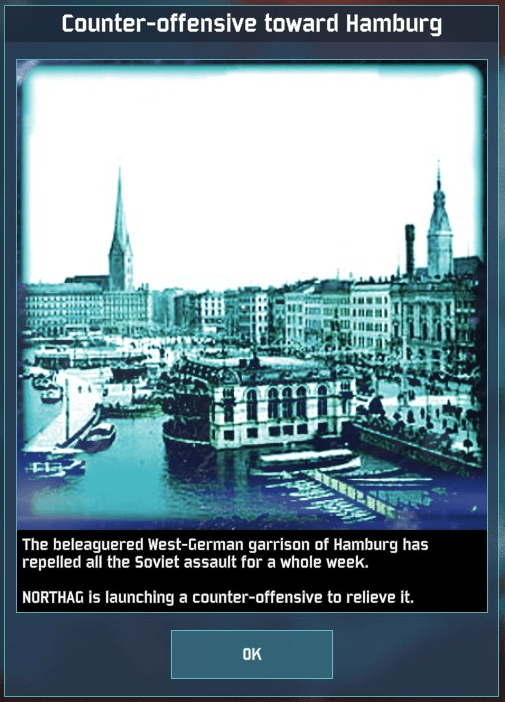 I call in my first strike on the strategic map, a commando raid on the East German regiment in Kiel. That will reduce their initiative, and just as importantly, prevent it from moving this turn – I want to give the Danish army time to rest up. Meanwhile, in the north, the Norwegian and Swedish armies are now almost in place. They’re generally in decent shape, but unfortunately the Swedish 9th Pansarbrigaden (stationed at Gol, Norway) is now at 0 initiative after being hit by air raids, and some of the other units anchoring my western flank aren’t much better off. They won’t have much more time to rest and refit before the Soviets come knocking. The resulting fight is vicious. The paratroopers lack heavy weaponry, but bring hordes of elite infantry supported by missile-armed jeeps. But in a case of the worm turning, entrenched reservists manage to shred an attacking paratroop column (see below), and once the paratroops’ missile vehicles are whittled away, even my antiquated tanks get their chance to shine. When the dust has settled, the 234th Guards VDV Regiment has been completely wiped out, and I have another 60 morale points under my belt.